A palatial three storey 5 bedroom colonial style villa right on the beach front at Bophut on the northern coast of Ko Samui, this evocative and luxurious holiday destination is the perfect place to unwind in peace and privacy, and yet be only minutes from chic boutiques and restaurants. And of course, direct beach access and stunning sea views! This gracious yet contemporary villa is set in the heart of Fisherman's Village, Bophut, and is the only absolute beachfront residence there. The village is steeped in authentic island charm with its traditional wood shop-houses, many of which have been converted into boutiques and top class restaurants. The subtle blend of Thai and wider international influences and cuisines have created a unique atmosphere here. The villa is centrally located for the greatest enjoyment of all that Fisherman's Village has to offer, and is also only 15 minutes away from Chaweng, the island's main tourist centre, and 10 from the International Airport. The colonial-inspired design of this villa, together with its sumptuous fittings and furniture, and the overall use of white for furnishings, bed linen, walls, kitchen and bathroom units, has created a bright and light interior reminiscent of another age, and yet totally infiltrated with all the modern requisites needed by a 21st century holiday maker. The villa has two comfortable living rooms with satellite LCD TV/DVD/CD systems, a roof-top Jacuzzi with a private terrace, complimentary Wi-Fi ADSL Internet access throughout, and electronic safes in all bedrooms. All of the five bedrooms suites are air conditioned, and there are fans in the living rooms. Its layout and design make this an ideal holiday location for families or a group of friends to share, as each floor offers comfort and privacy when this is required, and the central areas allow guests to relax and enjoy themselves together. The entrance to this visually stunning property is through an antique and eye-catching Shanxi doorway, the deep colour and texture of the wood contrasting beautifully with the smooth white facade of the building. And the inside repeats the colour scheme with white walls and ceilings, white plantation-style shutters, and the deep rich brown of the recycled teak floors. Each room has been attentively furnished in an intimate Indochine style, with antiques and artwork from Cambodia, Laos and Vietnam, plus Burma and, of course, Thailand. 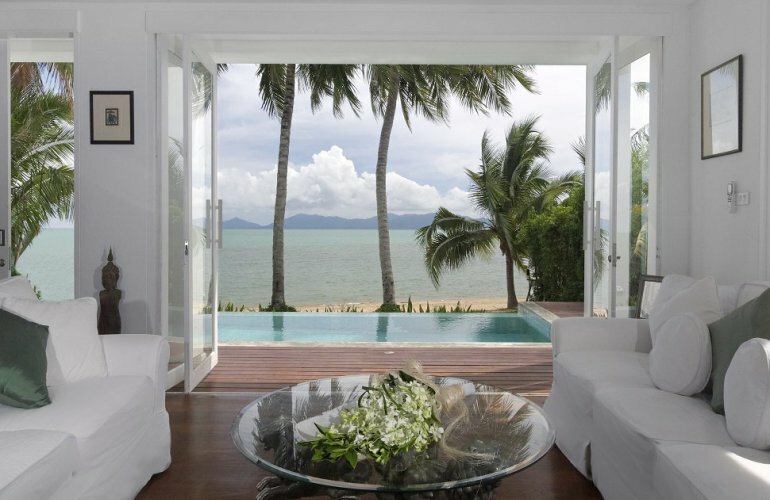 On the ground floor of the villa is the first of the living rooms, which faces the beach and enjoys wonderful views. There is a fully fitted and equipped designer kitchen with a breakfast bar separating it from the dining area. The silver dining table is glass topped and has bone-inlaid chairs from Rajasthan. The breakfast bar stools match the dining room chairs. Glass doors open up this ground floor living room to the teak pool deck and the pool itself. Also on the ground floor are a laundry room, and a private study with a library for some quiet relaxation or reading one of the available books. This room could be used as a child's bedroom if desired. The first of the four queen size bedroom suites is on the ground floor too. The en suite to this bedroom has a bathtub. A feature open teakwood staircase leads up to the first floor of this beautiful home, where the second elegant sitting room is located. This room too is furnished with antique pieces and has a balcony along its length, which is also available to one of the first floor queen bedroom suites. The balcony has plantation-style loungers. There are three queen-size bedroom suites at this level. One of the suites has a large balcony, and a bathtub. A second suite enjoys the sea views and has access to the large balcony that extends across the living room. The king-size master bedroom suite is on the top floor and it has two large rooftop terraces, ideal for al fresco dining, enjoying the spectacular views over the pool, garden and beach towards Koh Phangan, or just peacefully sunbathing. Steps lead up from one deck to a sunken Jacuzzi, a large entertainment area with a bar, storage rooms and a guest bathroom. The infinity edge pool is surrounded by lawn and is just a step away from the beach and ocean.